Hare Krishna. PAMO. All glories to Srila Prabhupada. Love your online journal. I appreciate your vast knowledge of the shastras and keen sense of humor. Also, your spiritual commentary on news events is refreshing. If you would be kind enough to share your daily homa, it would be very appreciated. If not, I fully understand and hope that you can point us in the right direction. This is a photo of the setup. 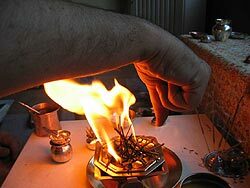 The elements I use in offering homa for the pleasure of the Lord are compact and simplified. In the middle of the photo is a vedi constructed of 3 pieces: a base plate of brass, a copper kunda (available in Loi Bazaar), and a good strong 8-sided bell-metal plate that has a circular fire pit in the middle. As you see in the photo the fire pit is now stocked with bits of wood. Actually these are incense sticks broken to size. Bamboo is used for making joss sticks, and bamboo is one of the 7 kinds of woods recommended for yajnas. I've sprinkled camphor and ghee on to the sticks. 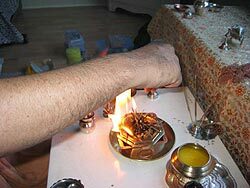 To the north of the fire altar (from the Vedic point of view it is actually east but that's too confusing--take north in this picture to mean "in the direction above the vedi") is an incense holder in which 5 sticks of incense are burning. 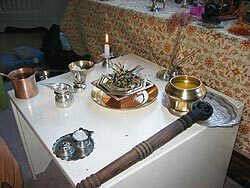 To the northeast is a silver plate bearing a brass ghee pot and the sacrificial ladel. 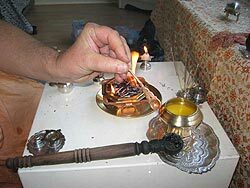 To the southeast is a incense holder which, like the one to the north, also has a holder for a small ghee wick. I've put camphor into that holder. To the southwest is a copper acamana cup and spoon for myself, a silver acamana pot and spoon for the fire, and a little silver kumbha (pot topped with coconut and five mango leaves). To the west is a brass bowl with extra camphor, should that be needed. 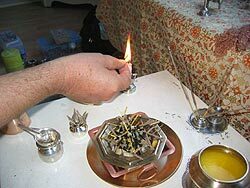 To the northwest is a candle, standing by as the "garhapatya flame" or source of fire for the offering. 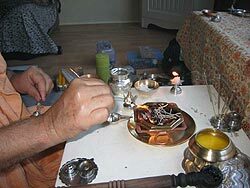 I ingite a piece of camphor and drop it into the camphor at the southeast of the vedi. I chant: om kravyadam agnim prahinomi duram yamarajyam gacchatu ripravahah. This mantra is for casting away the inauspicious aspect of fire. ...showing avahana-mudra, I chant iha 'gaccha iha 'gaccha. 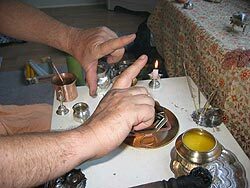 Then, showing stapana-mudra, I chant iha tistha iha tistha. Showing sannidhapani-mudra, chanting iha sannidehi iha sannidehi. Showing sannirudhana-mudra, chanting iha sannirudhyasva, iha sannirudhyasya. Showing sakali-karani-mudra. Showing sammukhi-karani-mudra, chanting iha sammukho bhava iha sammukho bhava. Showing cakra mudra and chanting om astraya phat! Snapping fingers 8 times in 8 directions around fire. Showing hrdaya-mudra, chanting klim-hrdaya namah. Showing sirsa-mudra, chanting krsnaya-sirse svaha. govinda-sikhaya vasat. 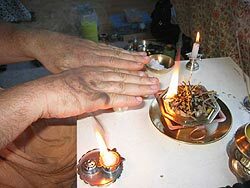 Showing kavaca-mudra, chanting gopijana-kavacaya hum. 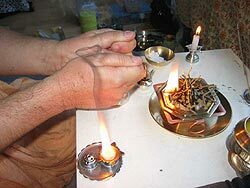 Showing netra-mudra, chanting vallabhaya-netrabhyam vausat. Now I worship the fire with mudra and water offerings. 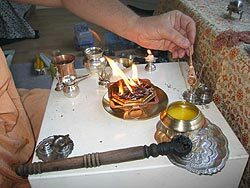 I chant etat-padyam om sri vaisnave namah and with the silver spoon offer a drop of water from the Lord's acamana pot onto the brass base place of the vedi. I meditate upon washing the lotus feet of Lord Vaisnava Agni. 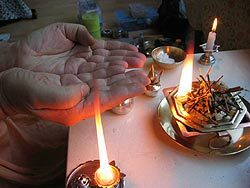 I show the arghya-mudra and chant idam arghyam om sri vaisnave namah as I offer a drop and meditate upon offering Him scented water for washing His hands and face. I show acamaniya-mudra, then chant idam acamaniyam om sri vaisnave namah as I offer a drop, meditating on refreshing the Lord's mouth by acamana. I show the acamaniya-mudra again, and chant idam punaracamaniyam om sri vaisnave namah while offering a drop and meditating upon refreshing His mouth once more after He has taken a sweet drink. I show the madhu-parka mudra, then chant esa madhuparka om sri vaisnave namah while offering a drop and meditating upon giving a sweet drink to the Lord. 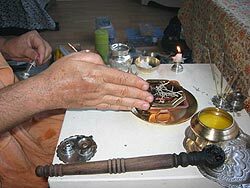 Gandha-mudra, chant esa gandha om sri vaisnave namah, offer a drop, meditate upon applying scented oil and sandalwood pulp to the Lord's body. Puspa-mudra, chant etat sacandana puspani om sri vaisnave namah, offer a drop, meditate upon offering flowers to the lotus feet of the Lord. 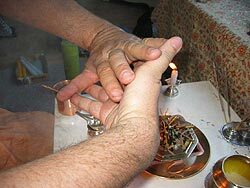 Malya-mudra, chant idam malyam om sri vaisnave namah, offer a drop, meditate upon garlanding the Lord. 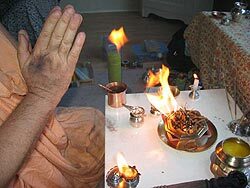 Sarva-mudra, chant idam sarvam, offer a drop, meditate on the Lord kindly accepting my worship as complete although it is sadly so incomplete. Then I show pranama-mudra again and chant yat-pujanena vibudhah pitaror-iccatas ca tusta-bhavanti rsi-bhuta-saloka-palah sarve grahas-tarani soma-kujadi mukhya govindam adi purusam tam aham bhajami, a Pancaratrik verse that declares that worship of Govinda includes worship of forefathers, rishis, all living entities, the guardians of the directions, all the planetary deities, etc. Purifying ghee pot with water. 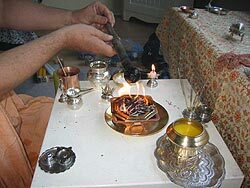 Passing ghee pot through fire 3 times, starting from left to right each time. Purifying sacrificial ladle with acamana water. Passing the ladle through fire 3 times, starting from left to right. 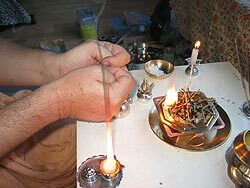 Putting drops of water into right palm, turning palm sideways on the right side of the vedi so that the water sprinkles in a straight vertical line, I chant om ananta anumanyasva. Doing the same along along a horizontal line south of the vedi, I chant om acyuta anumasyasva. And doing the same along a vertical line on the left side of the vedi, I chant om sarasvaty anumanyasva. 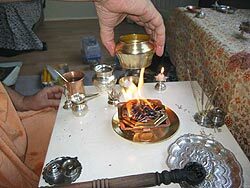 Then I take the silver coconut with 5 leaves off the top of the kumbha, dip a leaf in the water of the kumbha, and sprinkle the water around the vedi while chanting Om klim gopijanavallabhaya namah. 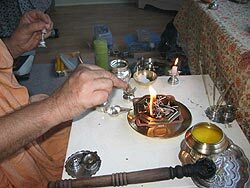 Now the yajna beings. Om bhur svaha idam visnave idam na mama; om bhuvah svaha idam acyutaya idam ma mama; om svar svaha idam narayanaya idam na mama; om bhur bhuvah svah svaha idam anantaya idam na mama. 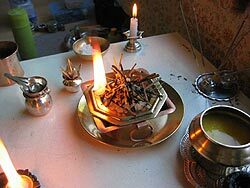 This is called the Vyasta Samasta Mahavyahrti homa. What shoud follow this are sixteen offerings that could, as you have been doing, be accompanied by chanting the sixteen prayers of the Purusa Sukta. Actually you can chant any sixteen prayers you like. You can take sixteen prayers from Bhagavad-gita, for example. 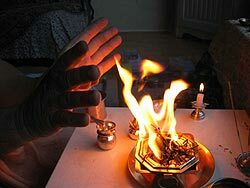 In the yajna I do, I begin with four Vedic mantras--the first prayer of Purusa-sukta, then two mantras from Taittirya Brahmana, then a Yajur-veda mantra--and then I chant the oblation mantra given in SB 6.19.8 twelve times, putting fire into the ghee after each time and chanting svaha. This Bhagavatam oblation mantra is a short form of a puja mantra given in the previous verse. In his purport to that verse, Srila Prabhupada states, "This mantra is very important. Anyone engaged in Deity worship should chant this mantra, as quoted above, beginning with om namo bhagavate maha-purusaya." 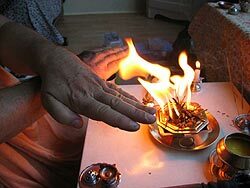 Vyasta Samata Mahavyahrti homa is performed again, followed by Mula-Mantra-Gayatri homa: chanting aim guruva namah, klim gauraya namah, klim gopijanaballabaya namah, srim-klim radha-krsnabhyam namah, ksraum narasimhaya namah and om sudarsanaya namah, I offer ghee into the fire with each mantra. On days like ekadasi when it is nice to increase the service to the Lord, I chant each mantra 10 times with an offering each time. 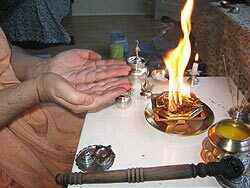 After these mula-mantra/gayatri offerings I again do Maha Samasta Mahavyahrti homa. This is followed by Udicya Karma. 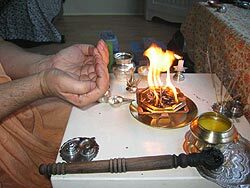 The fire is "changed" from Vaisnava-agni to Vidhu-agni. This is done by showing the installation mudras and chanting the associated mantras (om vidhu namagnaye iha vaha iha vaha; iha tistha etc.). Then the nyasa mudras should be shown, and their mantras chanted (klim hrdaya namah; krsnaya svaha etc.). 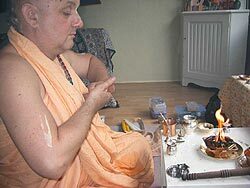 Vyasta Samasta Mahavyahrti Homa again. 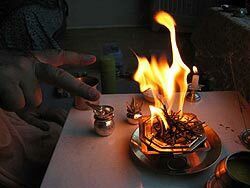 Then Vaisnava homa, which I've condensed to the om ajnana timirandhandasya mantra (one ahuti or offering in the fire), the two Srila Prabhupada pranama mantras (two ahutis), the vanca-kalpa verse (one ahuti), the Panca-tattva mahamantra (one ahuti) and the Hare Krsna mahamantra (one ahuti). Then I sprinkle a circle of water around the vedi from the silver kumba leaves, chanting Om klim gopijanavallabhaya namah; then I sprinkle water from the side of my palm on 3 sides of the fire, chanting (these mantras are a little different from the first time around): om ananta anumamsthah, om acyuta anumamsthah, om sarasvati anumamsthah. 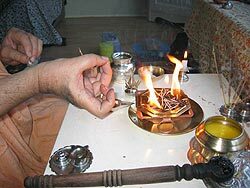 Then I rise to perform purna ahuti. 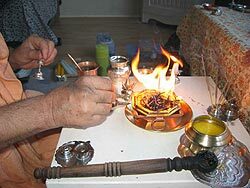 I chant the namo brahmanya devaya verse and offer ghee into the fire: idam krsnaya idam na mama. 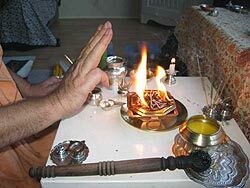 Then showing the maha mudra and pranam mudra I recite the invocation to Sri Isopanisad (om purnam adaha purnam idam...). The comes Vamadeva-gam. Still standing, I take up the silver kumbha and sprinkle water on the "northwest" side of the fire, chanting om bhur bhuvah svah kaya nas citra abhuvad uti sada vrdhah sakha kaya sacisthaya vrta. Again sprinkle in the same place, then chant om bhur bhuvah svah kas tva satyo madanam mamhistho matsad andhasah drda cidaruje vasu. Again sprinkle in the same place, then chant om bhur bhuvah svah abhi sunah sakhinam avita jaritrnam satam bhavasya utaye. Mantras for forgiveness of offenses follow. Then Prema-dhvani prayers (Jaya om visnupada paramahamsa...etc.). At the end one should glorify Lord Vamanadeva. 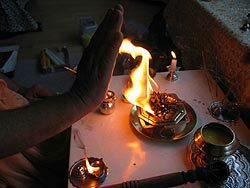 I chant the calayasi vikramane balim... prayer from Dasavatara-stotram (actually I chant the whole stotram because it is so auspicious, but the verse to Lord Vamana is needed to end the yajna. The reason is given in SB 8.23.31p.